You’ve heard of the e-mail abbreviations LOL, POS and even NSFW. But add another to the lexicon: LDL. Lloyd Blankfein, chairman and CEO of The Goldman Sachs Group. You’ve heard of the e-mail abbreviations LOL, POS and even NSFW. But add another to the lexicon: LDL. “They were very careful about e-mail,” the aide said as she briefed reporters on several of the hundreds of e-mails that the Senate Permanent Subcommittee on Investigations planned to release Tuesday in its investigation of the role Goldman Sachs played in the financial meltdown of 2008. Still, according to the committee, they weren’t quite careful enough. Reading through the e-mails released by the Securities and Exchange Commission, Goldman itself and now the subcommittee is a voyeuristic experience. And it’s a reminder of an important Washington lesson: It’s always the e-mails that get you. E-mails got Jack Abramoff. E-mails and text messages got former Rep. Mark Foley. And e-mails got the Enron traders who joked about shutting off the lights on “Grandma Millie” in California. The immediacy of the medium makes it irresistible, though. And as a result, many of the most intimate thoughts of a person who suddenly finds himself or herself at the center of a scandal are available for public view. That’s certainly the case with Fabrice Tourre, the young trader at the heart of the SEC’s case against Goldman Sachs. Tourre, who referred to himself as “Fabulous Fab” in at least one e-mail, complained about working grueling hours at Goldman Sachs, setting up complex trades. In another message, he tells a colleague that he sold bonds to “widows and orphans” in Belgium. But Tourre is not the only person whose real-time thoughts and comments are being pored over by investigators looking for evidence of wrongdoing. 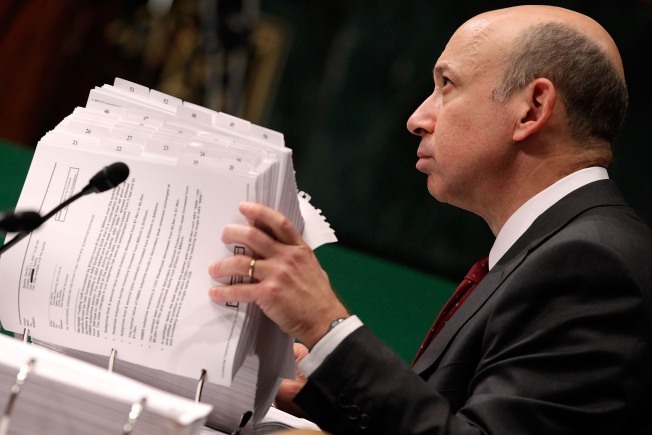 Goldman Sachs CEO Lloyd Blankfein is seeing his own e-mails splashed in newspapers. In February 2007, Blankfein responded to a colleague, seemingly urging him on to sell mortgage-backed securities that were in danger of collapsing in value — perhaps to Goldman’s own clients, said a Senate aide. “You refer to losses stemming from residual positions in old deals,” Blankfein wrote. The thoughts, no matter how formal and technical in the Goldman e-mails, are expressed in more unvarnished terms than they would be in public. “They structured like mad and travelled the world, and worked their tails off to make some lemonade from some big old lemons,” one Goldman executive said of his team at the firm. Now there’s an e-mail that should have been an LDL, since it was so NSFW.